This elegantly styled personalized diamond eternity ring, a fine jewelry design available exclusively from The Ashton-Drake Galleries. Personalized with his and her names in a classic style of two bands intertwined, this double band ring is a beautiful reminder of all you feel in your heart. Handcrafted with two intertwined bands of sterling silver, this personalized diamond eternity ring is richly plated in 24K gold for a regal finish. One band will be embellished with the names of you and your loved one, expertly engraved in a graceful script. 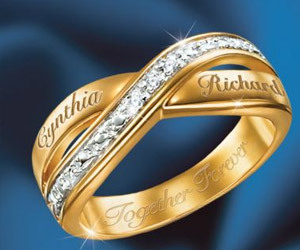 The second band joins your names together with a sparkling curve of diamonds that sweeps across the top of the ring. Complete with the inscription, “Together Forever”, this sentimental double band ring is the perfect personalized Mother’s Day jewelry gift for a precious Mom. Don’t wait – high demand is expected.